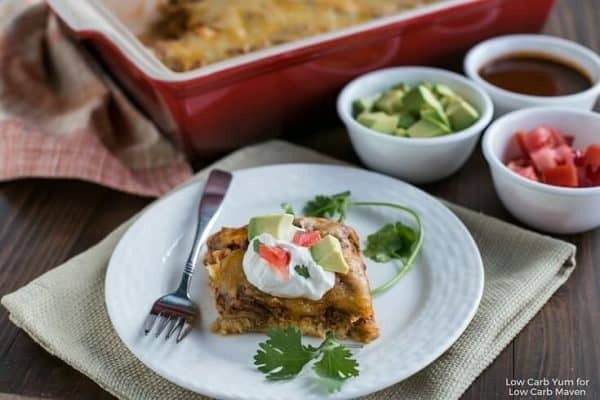 Casseroles make great family meals – they are simple and quick to prepare, are quite hearty, and if done right can be very healthy! There are two instances where I am likely to make a casserole – on a weeknight when I am short on time, or on the weekend when I have time to do some meal prep. While my husband may be quite happy to eat a steak every day, our budget can’t quite manage that. So, we eat a lot of chicken. 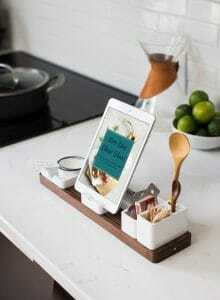 It is just so simple to cook, and more importantly it is affordable! 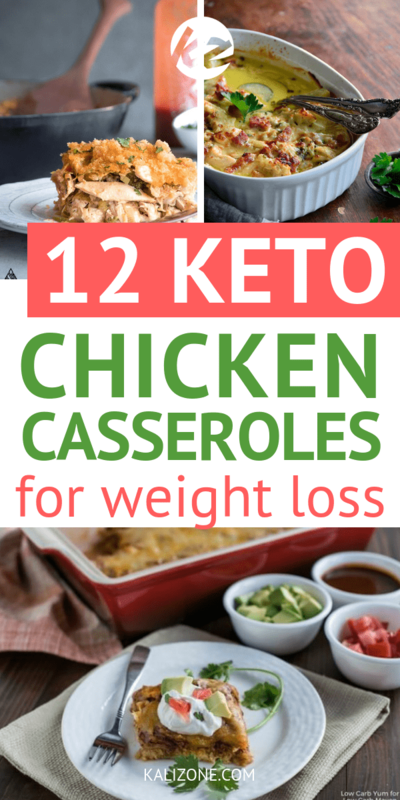 Even though chicken in itself isn’t very fatty, I love using it in my keto recipes. To up the fat content, I add in healthy fats. 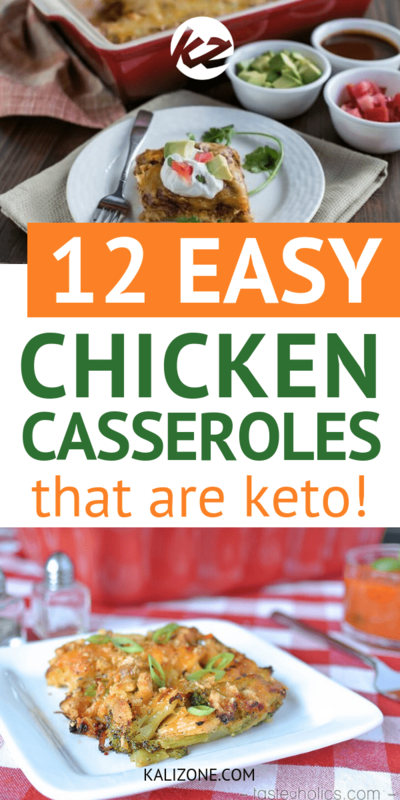 I use chicken for all sort of meals, but I especially love using it in casseroles! 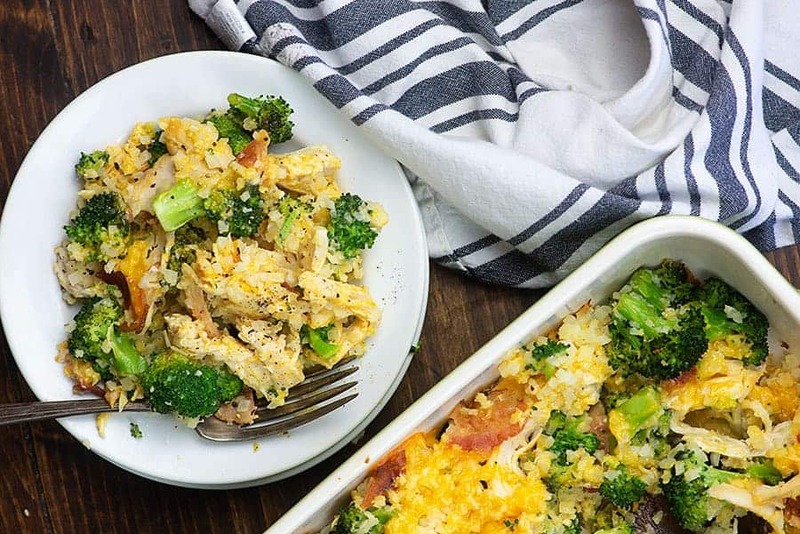 Keto chicken casserole dishes are suitable for the whole family – even those that aren’t on keto. So you won’t have to worry about making separate meals if your partner or children aren’t following the keto diet. 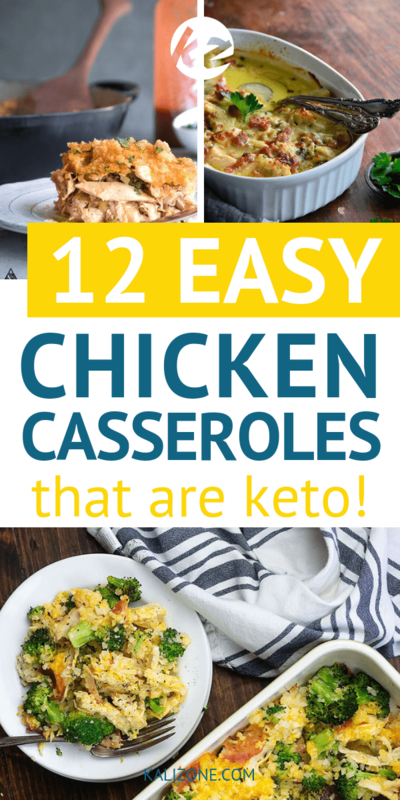 Here is a collection of 12 Keto Chicken Casserole recipes to give you some ideas for your next meal! This recipe has three things most of us love – comforting food, cheese, and simplicity. This is a perfect recipe choice to make for friends and family that aren’t doing a low carb or Keto diet as its flavours and textures will be very familiar. Take this to a potluck and watch it disappear! Keto, creamy, and full of Alfredo flavour. 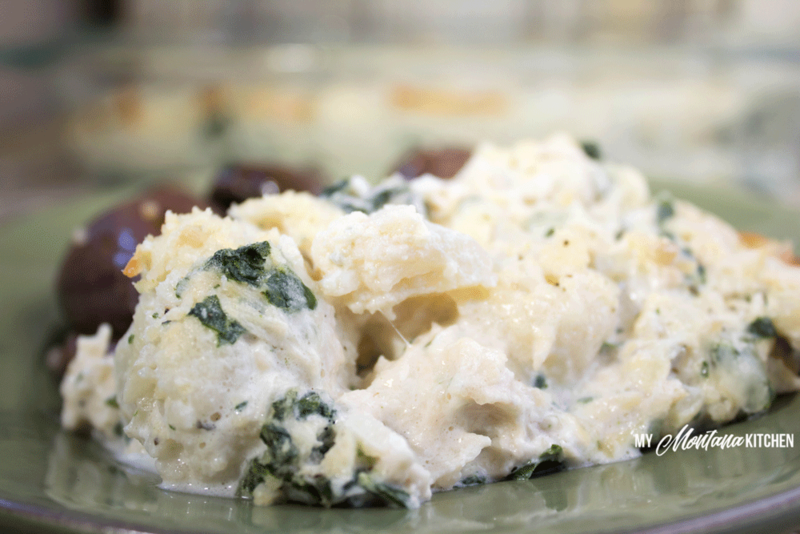 This low carb Keto meal is also gluten-free making it ideal for those who are sensitive to gluten.This creamy dish has an extra antioxidant boost from all the spinach. To switch things up you can swap out the cauliflower for broccoli – an option that can help those with IBS also. Looking for a recipe that will impress – while also being super simple to prepare? 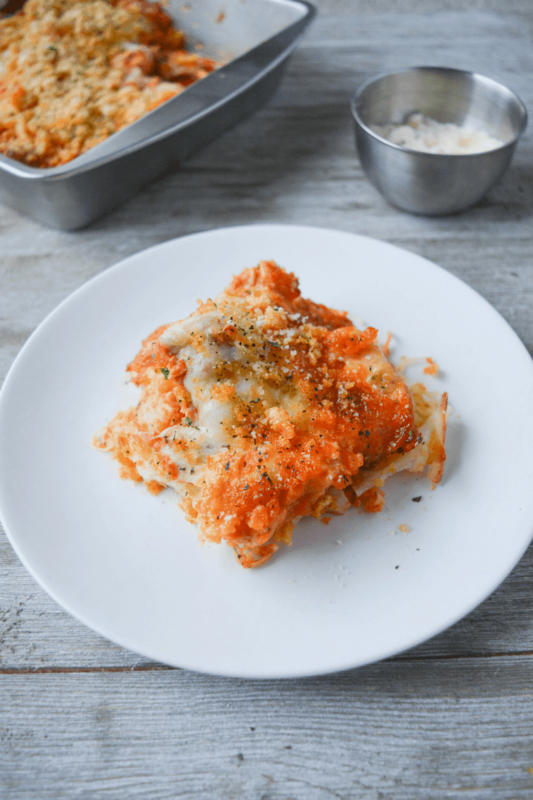 Give this Keto Chicken Parmesan Casserole a go. This keto casserole combines that perfect combination of tomato and cheese! This recipe is totally beginner friendly so give this Italian favourite a go. Cheddar is a cheese that almost everyone loves! It’s a safe cheese if you cooking for someone that isn’t mad about cheese but still wants a cheesy meal. 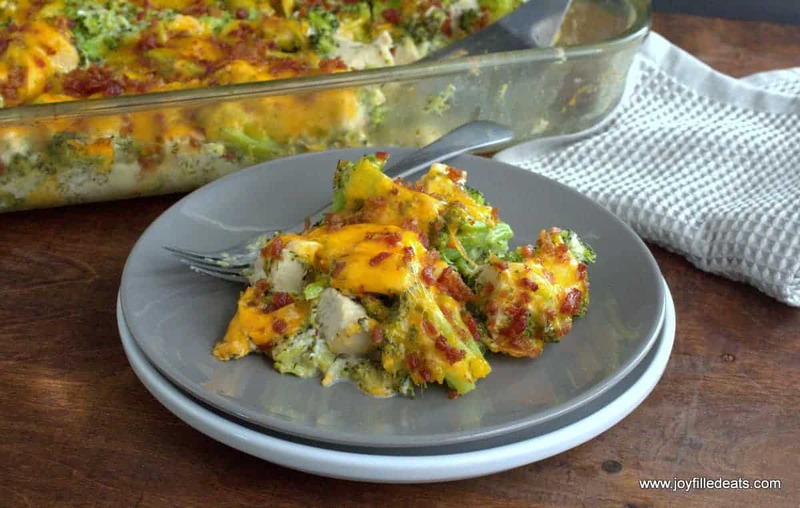 This meal combines the simple savory flavours of cheddar cheese and baked broccoli in a creamy dish. But what really makes this one stand out from all the rest is the topping of crushed pork rind! Meet the cauliflower rice casserole. This is one for the whole family (or if you’re cooking for one, six days worth of dinners!) This is quintessential comfort food perfect for winter time. This recipe can be simplified by using frozen cauliflower rice and the results are very similar – no one will notice. If low carb is boring you’re doing it wrong! 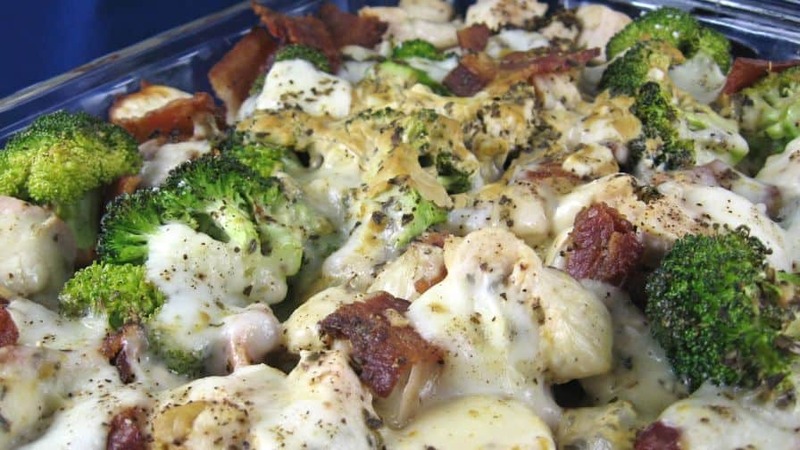 These flavours – chicken, bacon and cheese all work together and enhance each other – culminating in a hearty healthy fat low carb meal. No store-bought ranch here, this recipe includes homemade ranch sauce. 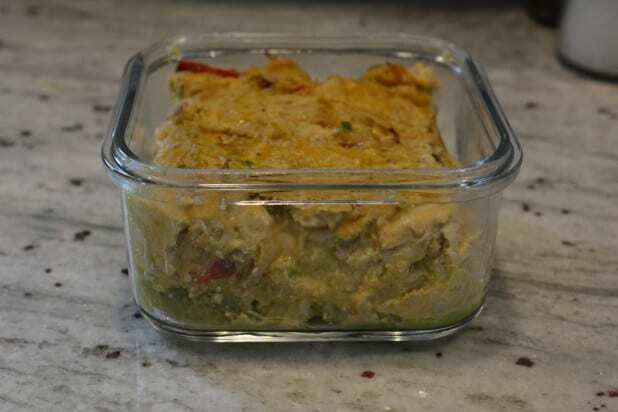 For those times where you have a little too much month at the end of your budget, there is the Spicy Mexican low carb chicken casserole. This recipe works perfectly with leftovers, is filling, and simple to prepare. 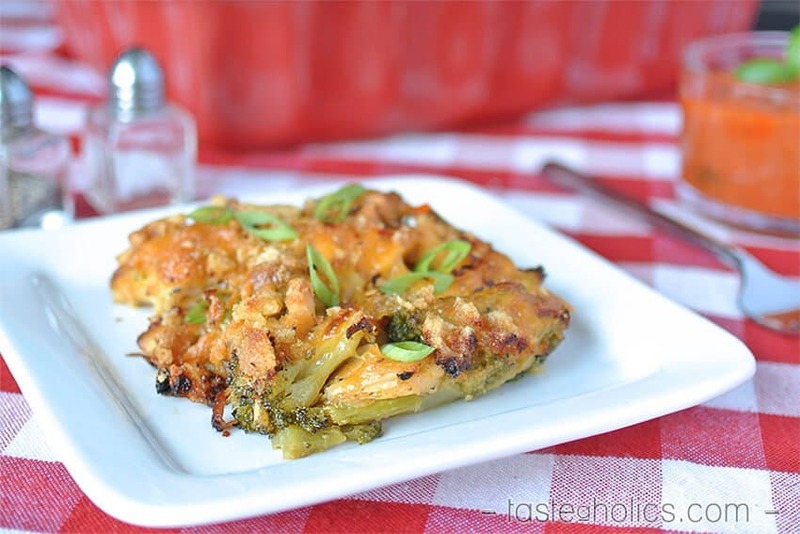 This Chicken Cauliflower Casserole tastes like a baked potato casserole! The whole family will love this comforting and filling meal – even those who aren’t keen on cauliflower. The traditional chicken mushroom casserole uses cream of mushroom soup (often from a tin). Not keto. 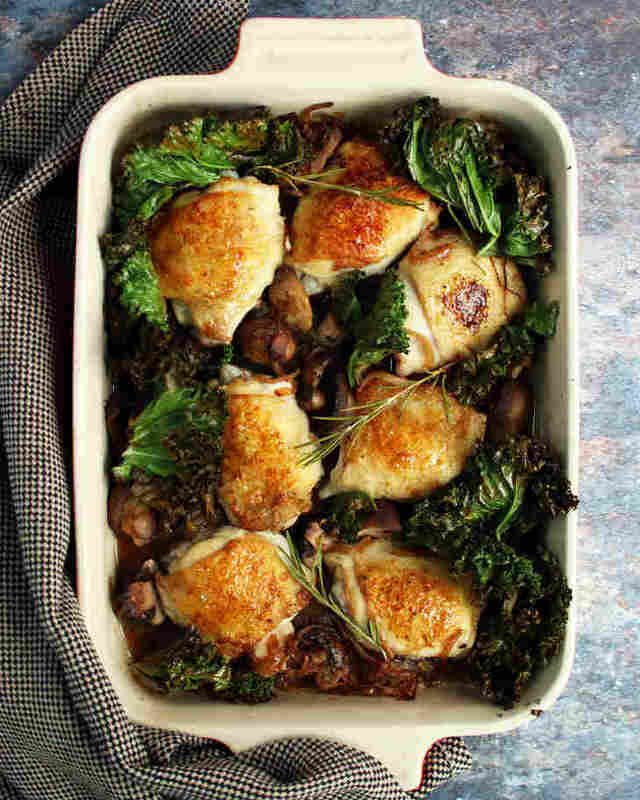 But you can still have Try this awesome those classic chicken mushroom casserole flavours using fresh mushrooms. Keep in mind this version is not as creamy as a traditional casserole, though. This recipe happens to be dairy-free, which is great if you are lactose-intolerant, or just want to reduce your dairy intake. 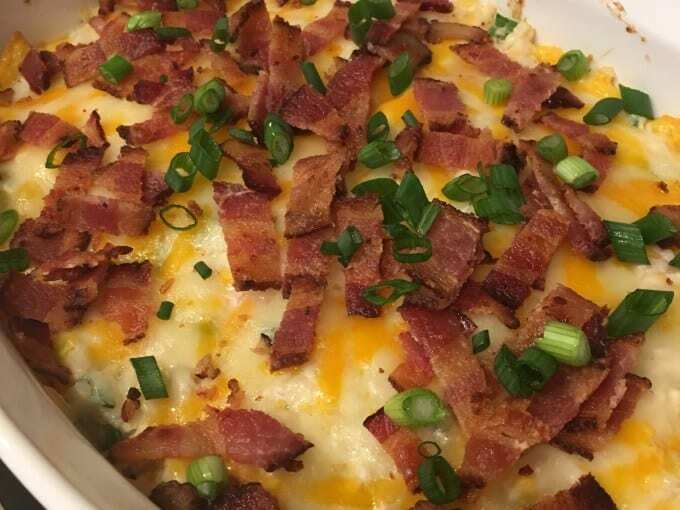 This Keto Chicken Cordon Blue Casserole may sound fancy, but it is so easy to prepare! 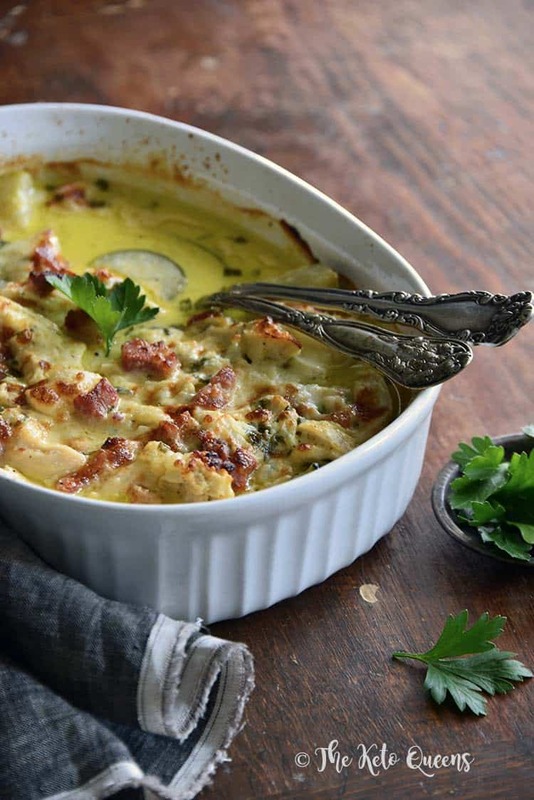 The chicken and zucchini is baked in a creamy cheesy sauce. This recipe is ideal for using leftovers of chicken. Quick tip – if you don’t have pork belly to sprinkle on top you can use crisped up bacon bits. There’s a running joke that ketoers put bacon in everything. But it really does add a delicious flavour to dishes – including chicken casseroles! Avocados are a fantastic addition to any meal because it has the combination of being high in healthy fats, as well as being high in fibre. It will last a week in the fridge, so this is a good recipe if you meal prep! 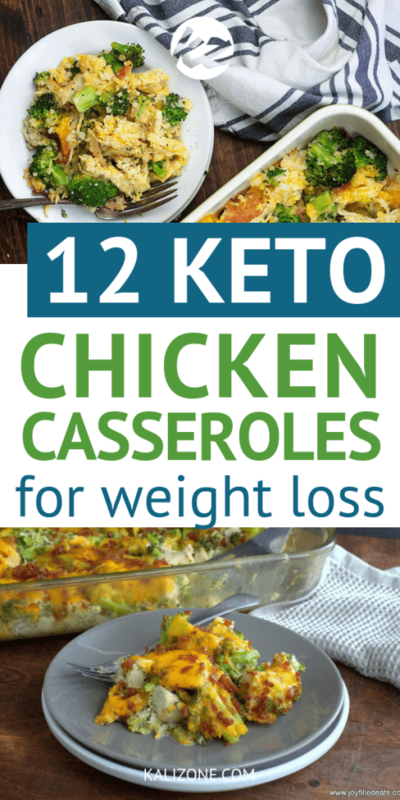 Did you enjoy 12 Keto Chicken Casserole Recipes To Help You Lose Weight?